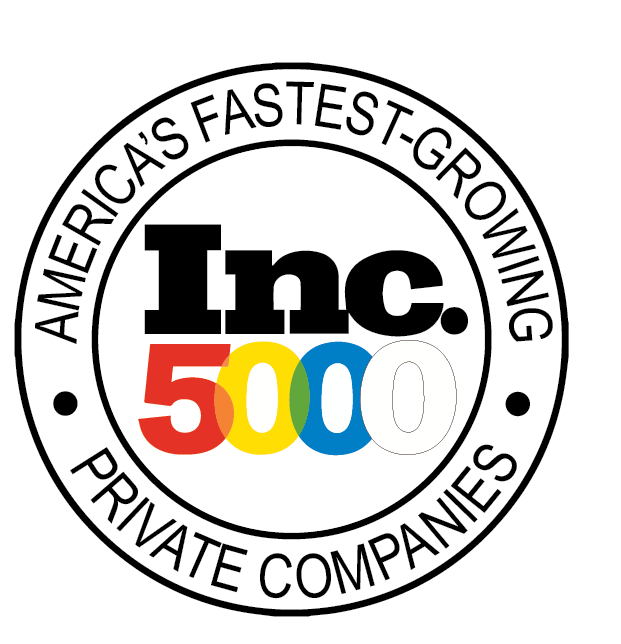 Level 3 credit card processing is probably one of the credit card processing industry’s best kept secrets. Merchants who use specific level 3-capable payment integration to their accounting systems or online shopping carts can save a substantial amount on their B2B transactions. 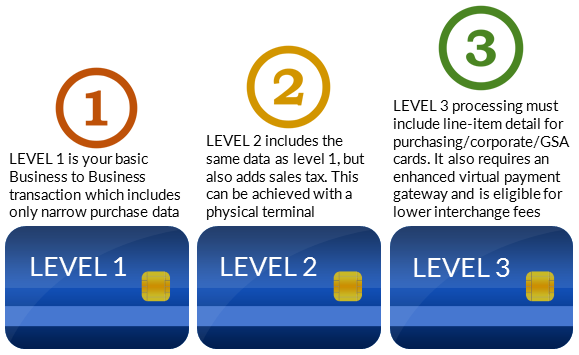 Level 3 is specific to B2B transactions, as more line item detail about your transactions can be provided to Visa and MasterCard which satisfies their requirements for a lower base cost, as that extra information is much less likely to be fraudulent than a transaction that only includes a name, a date, and a charge amount. Level 3 Processing was originally invented to prevent excess government spending. It allows invoice information, including line-item details, to be passed to the cardholder’s bank statement. Credit card issuing banks assign certain interchange fees for different types of cards. Interchange rates make up 80-90% of credit card transaction fees. However, there are ways to lower these fees if the merchant pays close attention to detail. In order to receive Level 3 Processing, merchants must accept either purchasing cards, corporate cards or government spending accounts (GSA) issued by Visa or MasterCard. If a merchant intends to accept GSA cards, they must achieve Level 3 pricing, as government entities, as well as some companies, require line-item detail to appear on their bank statements. Levels 1 and 2 are fairly easy to achieve. Level 1 processing can be achieved through any processing method, as it only requires standard transaction details such as amount and date. Level 2 processing adds the requirement of sales tax. 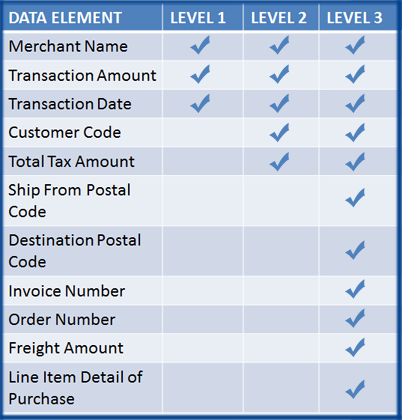 In order to achieve Level 3, there are nearly twenty fields of line-item detail that must be sent along with the transaction. Level 3 payments require details such as invoice number, freight amount, item commodity code, unit of measure and product code, among others. However, just because a merchant is eligible doesn’t mean they will receive Level 3 rates. Level 3 cannot be used with physical terminals. All of this information needs to be securely passed to a payment gateway that is capable of receiving this data, as many are not. If the data gets passed correctly, and it is the right type of card, then the bank will approve a Level 3 transaction. If a merchant misses even one of these details, they will not qualify for Level 3. Most other software interfaces require merchants to manually enter data by hand. EBizCharge integrates information that is already stored in your ERP system and sends it to our proprietary gateway. Merchants can put credit card payments on hold by preauthorizing a card. During a preauthorization, funds are not charged immediately. When a merchant is ready to create an invoice, they can capture those funds. If a merchant is unable to fulfill a sales order, they can release funds back to the customer instead of having to process the charge and issue a refund. In addition to submitting nearly twenty line-item details, there are also rules that can prevent merchants from obtaining Level 3 Processing. If these rules are violated, merchants can be downgraded to “standard” processing, which incurs a much higher interchange rate. First, merchants must capture funds for the same amount or less than the preauthorization. Second, after a card is preauthorized, merchants must capture funds within a few days. One of the biggest reasons why merchants don’t qualify for Level 3 is because they are either capturing for more than the preauthorized amount, or preauthorizing and capturing after the 48-hour window has expired. 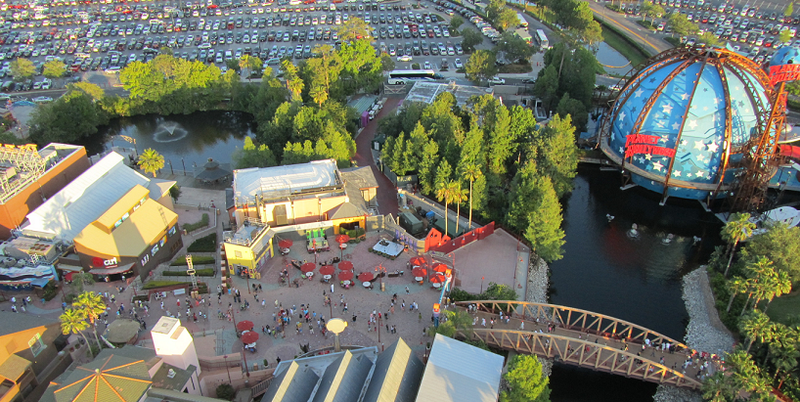 Although it is difficult to achieve, Level 3 Processing is certainly not without its perks. If achieved, Level 3 rewards merchants with reduced interchange rates.